Ariel Tallit is woven out of soft cotton and polyester yarns. It features a matching atarah (neckband), standard white tzitzis, and hand macrame fringing for beauty & quality. 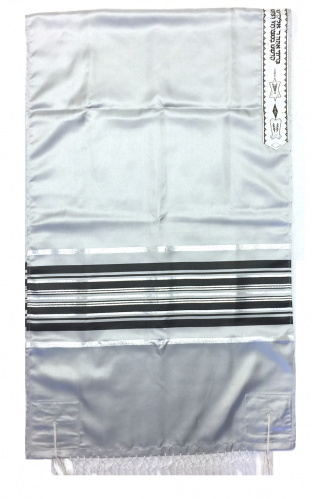 Gray/Black/Silver Ariel Tallit measures 22" x 72". Made in Israel. See our collection of Tallit Bags to coordinate.